A look at some of the no-fuss wood treatment options available for preserving your home's logs. There's a myth floating around that log homes are somehow challenging to maintain and therefore consume hours upon hours of our time and even elbow grease. This is nonsense—and a notion that's probably perpetuated by someone selling condos or stick-built homes. 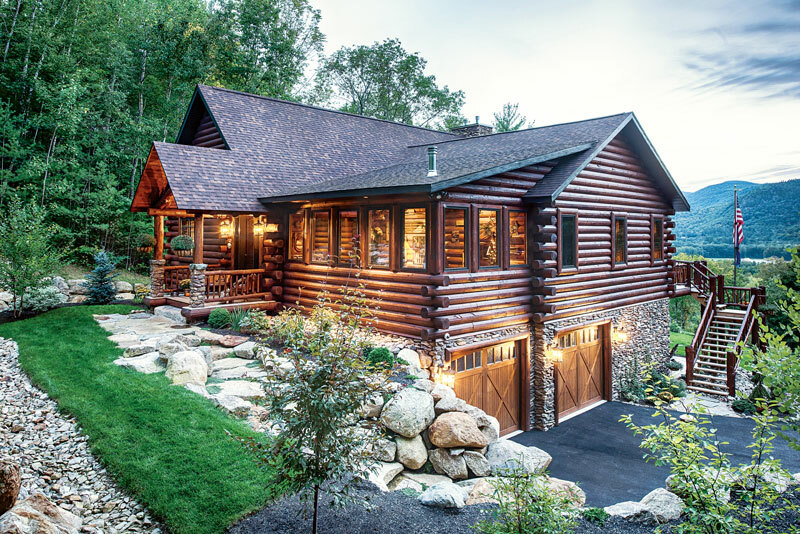 The bottom line is that log homes require the same amount of time and care than any conventional home, and some might argue that they require even less. As you might guess, most of our focus revolves around preserving the wood. As soon as a tree is harvested, it runs up against forces such as water, sun, fungi, mildew and insects. Throw in seasonal temperature swings, which cause wood to swell and shrink, and you're left with issues that can impact the health of your logs. Now the good news: Manufacturers have created hundreds of protective products that shield the wood on your castle from the elements. Designed to protect your new home, these treatments come in liquid, powder or solid form, and they serve different functions. Some seal out moisture, some block the sun, and some discourage bugs and fungi. Because water inside the wood can support a host of harmful organisms, the first step log home producers take is to reduce the moisture content of the logs. They may air-dry the wood for up to a year or more, heat the logs in huge kilns (reducing moisture and killing insect larvae) or use a combination of air- and kiln-drying. Some log home producers also protect the wood from insects and fungi by dipping logs in tanks filled with a borate-based solution or infusing them with a borate preservative through pressure treating. Once the logs are assembled at your home site, they should be treated with a cleaning solution to remove mill glaze, road grime, mud and dirt accumulated during construction. Each of these substances can prevent preservatives and finishes from adhering to the wood. To protect against fungi, mold, mildew and insects, some manufacturers add chemicals called biocides to their preservatives. Although these agents are safe for humans and animals, they kill the organisms that feed on wood. Manufacturers offer sunblock and pigmented preservatives to mitigate the damaging effects of the sun's ultraviolet rays. Depending on which product line you use, you may have to spread on a final finish coat after applying the wood preservative or stain. It's worth it: This finish coat will reflect ultraviolet rays and add another layer of water repellency.